Chapter 3 in Social Change Anytime Everywhere is really the heart of the book, I think, for many nonprofit practitioners. There are tons of great examples about organizations effectively using multichannel strategies (email, Facebook, text messaging) to engage and activate their constituencies around their causes. And there are specific suggestions about how to make these tools work for you, which is why I can imagine some busy nonprofit communications/resource development/advocacy professionals skipping right to chapter 3 and making notes on a legal pad of things that they just have to try. Share progress on your interim goals–particularly when looking at long-term policy changes–with your online community. Outline the specific actions you want people to take, but don’t oversimplify; if there’s no obvious alignment between the action and the seriousness of the problem, people won’t do anything, not because they don’t care or they’re too busy, but because you haven’t made the stakes explicit. Choose your targets carefully–we are too quick, I think, in advocacy, to think that our targets have to be members of Congress, or state legislators, when there are valid reasons to identify non-governmental actors or, even, elected officials from other levels of government, as the targets. And you can use different approaches, different messages, and different appeals to different constituencies with these targets, which enlarges your potential sphere of activism. Tailor your messages not just to your audience, but also to your channel. Yeah, we can’t just cut and paste our policy briefs into emails, but we shouldn’t have our Facebook feed into our Twitter, either. We can’t engage people through multiple channels if we are saying the same things across all platforms. We are way, way, way underutilizing mobile technology; nonprofits in the developing world, by necessity, are considerably ahead of us on this, using missed calls, for example, as ‘petition signatures’ on campaigns, following up on advocacy alerts with brief texts, sharing data through QR codes, adding real value to our constituents with well-done mobile apps. Question: What challenge, relating to online advocacy, is your organization grappling with right now? What questions do you think that you have to overcome, in order to move forward? What potential outcome excites you most, in thinking about the advocacy ‘pay off’ of multiple channel engagement? What question are you embarrassed to ask, that is keeping you up at night? 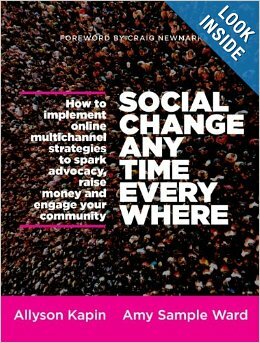 Let’s start 2014 right, with a giveaway of an exciting, infinitely readable, and immediately applicable book about using online tools to spark advocacy, raise money, and engage communities around your issues. I’m giving away a copy of Social Change Anytime Everywhere, by Allyson Kapin and Amy Sample Ward. Because I’m the one with the book to give away, and because I’m still clearing the cobwebs from my holiday break brain, this week’s posts will be a series of questions sparked, for me, from reading the book. I will randomly select a winner from among those who comment on any one of this week’s three related posts, and I’ll even pay to ship you the book. Because this year is going to be epic, for advocacy, people. Question: How do you integrate your online and offline engagement–advocacy, fundraising, volunteerism–around your cause(s)? How are these responsibilities shared, within your organization? What technologies and strategies do you find effective in both venues? 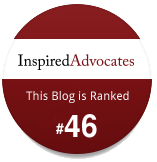 What do you find is the most successful ‘entry point’ for your advocates? How do you help them to bridge the gap to other types of engagement? There is little in this world that brings me more joy than seeing nonprofit advocates really hit one out of the park. Kids who go to bed right on time, maybe; fresh peaches off the tree; my allium when they bloom in spring. But, really, extraordinarily successful advocacy campaigns are near the top of the list, especially when they also cultivate grassroots engagement and address critical social issues. At the site Inequality.is, the Economic Policy Institute unveils economic inequality, as real, personal, expensive, created, and fixable. It’s all interactive, accessible, and compelling. What’s not to love about Robert Reich making the history of recent economic policy make sense to laypeople, in cartoon form? But it’s not just a gimmick; policy prescriptions are woven throughout, and the real experiences of those on the losing end of the U.S. economy feature prominently. And it matters, urgently and deeply, because inequality is a threat to our economic foundation, our societal fabric, and our democracy. The site is super well-done, not only a resource for those seeking to better understand economic inequality, but also those wanting a tutorial on how to make their issue more salient, and how to use technology to draw others in. Summer is in full swing around here, which, this week, means that I’m actually teaching dozens of young children in Vacation Church School this week, in addition to my ‘regular’ summer activities. And the weather is heating up, so, today, I bring you a list of really cool online stuff that you should see, if you haven’t already. Basically, I spend quite a bit of time looking at social justice-y things on the Internet, sometimes finding something that particularly catches my eye and inspires an entire blog post. More frequently, though, these links get copied and put into an empty blog post, without a definitive idea of what I’ll do with them. Here are those that I’ve encountered in the past several weeks, in no particular order. I’d love if you have your own cool stuff to share during these warm weeks. This was shared a lot on social media, so you may have seen it already, but I’m going to be using this brief video on wealth inequality in some of my classes this year. It’s worth checking out–we have enough, if we would just have better systems of sharing. I had the chance to work through this interactive tool assessing our ‘slavery footprint’ a few months ago, and I found it online again recently and redid it. Yes, it’s absolutely horrifying, how many slaves–literally, still, today–touch our lives every day. But we should be horrified. And this delivers the horror, very effectively. Beth Kanter had a post about the social mapping utility Ushahidi’s receipt of a MacArthur grant recently. I love maps, and I love crowdsourcing, so I love this. A lot. 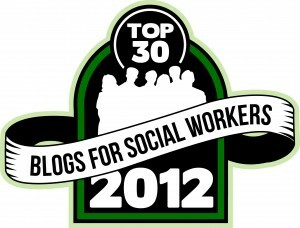 Another recent Beth Kanter post was about this year’s Blog Carnival, which asked bloggers to think, and then to write, about their big dreams for their nonprofit organizations or causes this year. It’s pretty incredible to see what leaders are dreaming about for their work in 2013, and it’s totally invigorating to imagine what the world will look like if we make those dreams come true. My husband and I are Kickstarter fans–he funded a book about a murder and controversial trial in frontier Kansas, recently, and I have chipped into some organizing and advocacy campaigns. We like microlending sites, too, and Sam has several active loans to entrepreneurs in the developing world. Here is another, similar idea, the Pollination Project. They’re giving $1000 seed grants to individual changemakers, one every day for an entire year. It makes me think about who I’d nominate, and how much fun it would be to have money to give away like that, and about the potential for money to incubate social change, even in small doses. In the same ‘doing good with money’ vein, albeit not really as much ‘cool online stuff’ (but you can read about it online, so, I mean, there), check out this story about the lottery winners from my neighboring state who are using their winnings to invest in their hometown, including improved recreational facilities for youth and a needed water treatment plant. What I love about this story, even more than the generosity, is what they bought–social goods, investments in the commons. Because those things still matter. And communities shouldn’t have to wait for someone to win the lottery to have them. http://www.innov8social.com/2013/01/infographic-social-change-is-not-fad.html. I like the way these infographics look and how they communicate their message, but I like even more what that message itself is–that, far from the stereotype of ‘apathy’, most people are doing something, in some way, to make the world a better place. My good friend from high school, Lenna, started an online fair trade shop last year called One Degree South. The premise is beautiful: she works collaboratively with female artisans in Kenya to design incredible jewelry and textiles and then sells them directly to buyers, online, for fair prices. It has brought stability and higher income standards to women formerly living in poverty in the developing world. And terrific jewelry to my closet. I love this blog post from Have Fun Do Good, about a woman who formed an effort to provide diapers to low-income mothers. What I love is that she set out not just to meet an immediate need–diapers are expensive–but also to engage mothers across class lines to push for changes that would support all moms and children. Here’s a list of folks to watch (and I love these lists, because what’s not to love about lifting up inspiring people and giving them some encouragement to keep being awesome? ), also from Have Fun Do Good. What should be added to the list? What warms your heart or brings relief these days? And where can we find it online?